This is no ordinary studio session. You can’t tidy your hair or pose in any traditional sense of photo-taking. This picture will be of a body part of your choosing. Artist Abby Robinson speaks with a participant for her project entitled "Body Imaging" at the P3 Studio in the Cosmopolitan in Las Vegas on Aug. 9. The project tries to incorporate the experiences of being photographed and going to see the doctor. Artist Abby Robinson photographs Brittany Du for her project entitled "Body Imaging" at the P3 Studio in the Cosmopolitan in Las Vegas on Aug. 9. Artist Abby Robinson, right, shows Brittany Du the photo she took of her for the project entitled "Body Imaging" at the P3 Studio in the Cosmopolitan in Las Vegas on Aug. 9. 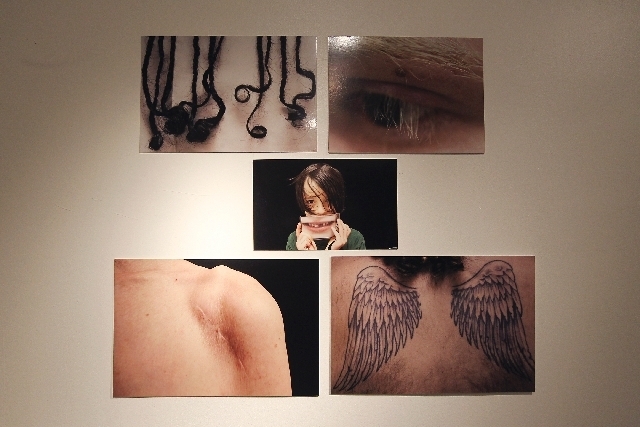 An example of artist Abby Robinson's photographs for her project entitled "Body Imaging" at the P3 Studio in the Cosmopolitan in Las Vegas on Aug. Imagine that Abby Robinson is about to take your picture. She was a Fulbright scholar and teaches photography in Manhattan and Shanghai, so you couldn’t do much better for a personal photographer. But this is no ordinary studio session. You can’t tidy your hair or pose in any traditional sense of photo-taking. This picture will be of a body part of your choosing. So, what part of yourself would you expose to Robinson’s lens? Your eyes? Chest? Maybe your toes or even a stray chin hair you forgot to pluck the night before? If you can name it, Robinson has probably photographed it during her installation “Body Imaging” at P3 Studio in The Cosmopolitan of Las Vegas. From the moment you walk into the space, you are immersed in Robinson’s performance piece regardless of whether you participate. The studio is designed to look much like a doctor’s office complete with a waiting room, exam area and desk. Robinson started the “Body Imaging” installation in New York City a few years ago when she was invited to be part of an art show. The location was inside an abandoned medical clinic. Robinson set up a fake clinic. She has always taken her camera with her to the doctor, photographing her own medical procedures so in her mind, photography and medicine already had an obvious connection. The response was varied. Some people thought she was really a medical professional. At P3 Studios, guests have wandered in asking how much she charges for her services or whether she sells men’s clothing. The process “takes art out of a certain context and applies it to areas people haven’t considered,“ Robinson says. Also on the form is a section of side effects caused by pictures taken of you. Career advancement, hypertension, fame and fortune and increased self-confidence are among the potential side effects you can choose. Once participants complete their forms, Robinson does a consultation with them. It’s during this part of the performance piece when she hears the stories of what people think about their bodies. Some people want photos taken of body parts they like, such as their eyes or hands. Those are the most common areas people select for photographing, Robinson adds. Once Robinson takes the photo, her subject helps select the best shot. She makes a copy and places it in a plastic badge holder with a lanyard. Robinson keeps one and the participant takes one home, for free. To get your VIP pass to yourself, you can visit Robinson at P3 Studios from 6 to 11 p.m. through Sunday . Contact reporter Sonya Padgett at spadgett@review journal.com or 702-380-4564. Follow @StripSonya on Twitter.